Interpretation is one means of helping people ascribe positive values and meanings to their nature tourism experience. Interpretive planning is the process of both delivering the interpretive media on offer, while also addressing the background settings in play as the visitor connects with the interpretive products. This approach to interpretive planning is a natural extension of our understanding of how different people engage with different precincts and experiences in different ways. Some users need to have the facts of the matter in hand before they can decide what values and opinions they may ascribe to a place. Others need to get a feeling for something before choosing if they want to learn more about it or not. These simple observations align strongly with our present day understanding of personality types as originally outlined by Carl Jung back in 1927. 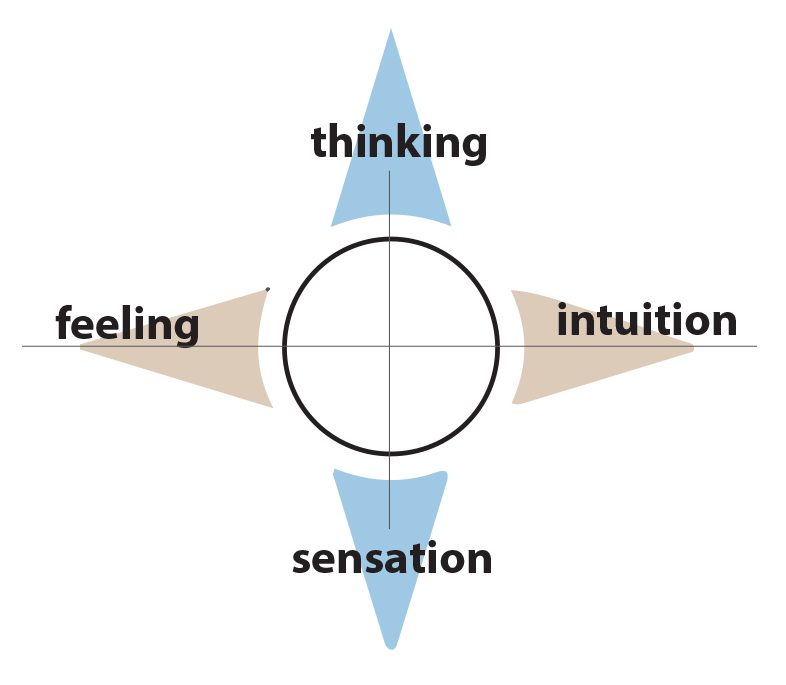 He identifed the four functional qualities we use to relate to the world around us – thinking/sensation and feeling/intuition. When we consider this in relation to interpretation it is apparent that people interested primarily in the "facts of the matter" pathway are using the thinking/sensation pathway pair as their first point of reference. Others preferring to initially get a feeling for a place are unconsciously using an emotional/intuitive approach to begin to connect with the experience on offer. This simple appreciation highlights the importance of interpretive planning going beyond the headline delivery of interpretive media to also consider the overall context and landscapes within which these experiences are delivered. The examples from Mungo National Park shown below illustrate how this approach can work in practice. 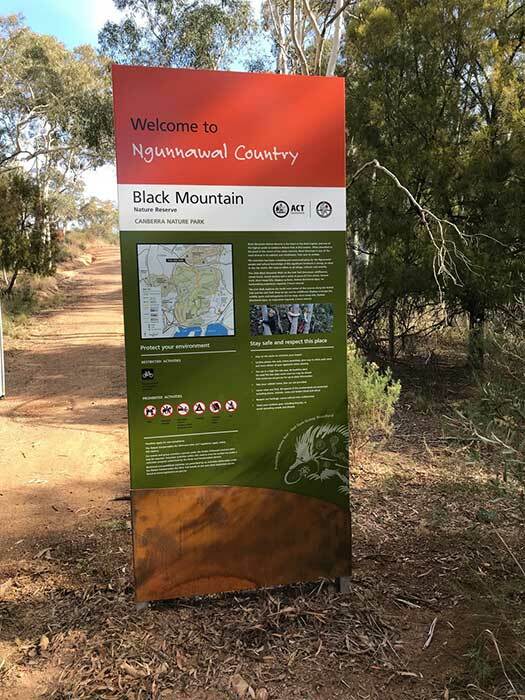 A feature example of how awareness of the four functional qualities can underpin the interpretive planning for a major precinct comes in the case of the work we undertook at Mungo National Park in 2010 as part of a specialist team assembled by Epacris Environmental Consultants. The challenge this project faced was how to interpret Mungo's human fossil trackways - the world's largest collection of ice age fossil footprints. Today the location of this large ensemble of footprints is a carefully guarded secret and the footprints themselves are covered by a protective layer of sand. Rather than embrace the idea of a technological 3D re-creation of the trackways delivered within the walls of the adjacent visitor centre as had been envisaged for the trackway interpretation, we recommended that they be experienced outdoors - in the open landscape that gave birth to them. 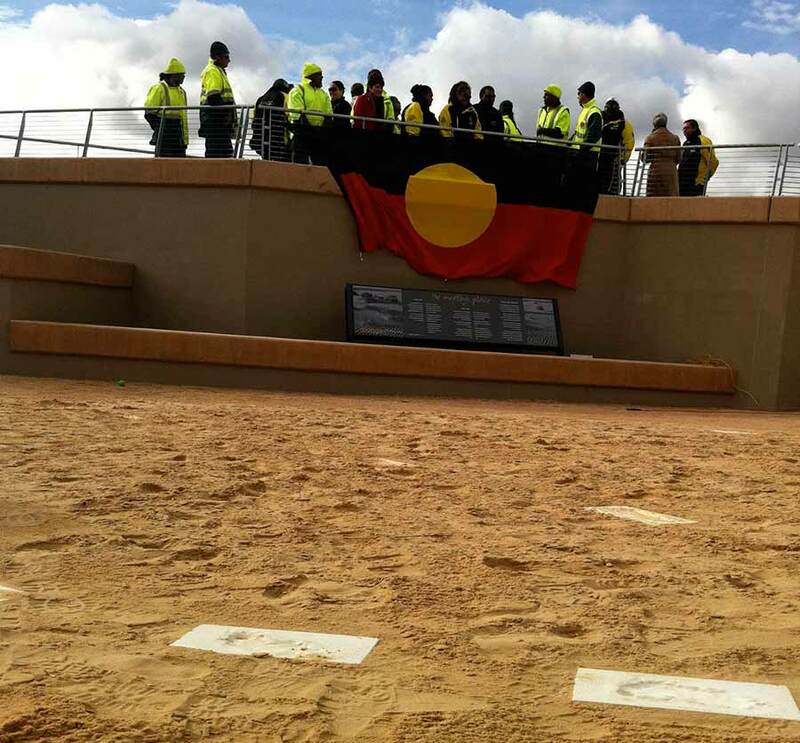 To this end, a section of 3D scanned replica footprints were installed in a custom designed amphitheatre created beside the visitor centre. 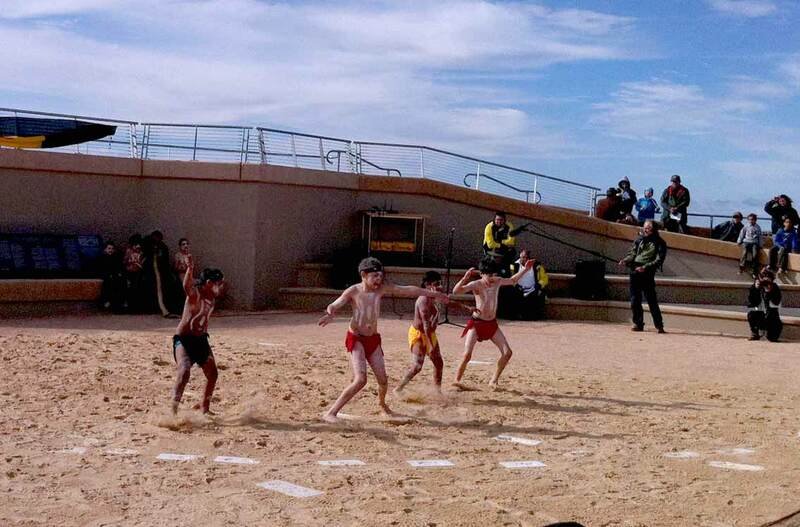 This venue also included special facilities to allow the Traditional Owners to gather around a fire beside the replicas of the footprints of their ancestors. This sense of ownership and pride in their heritage underpins the venue's sense of place. 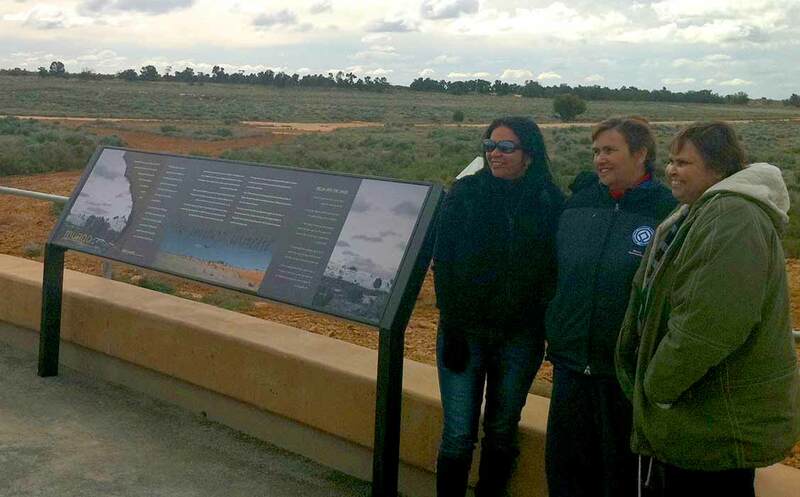 The landscape intervention mimicks the sweep of the lunette running around the 30km long dry Mungo lakebed. Visitors speak of immediately feeling like they have entered a considered, very special place. 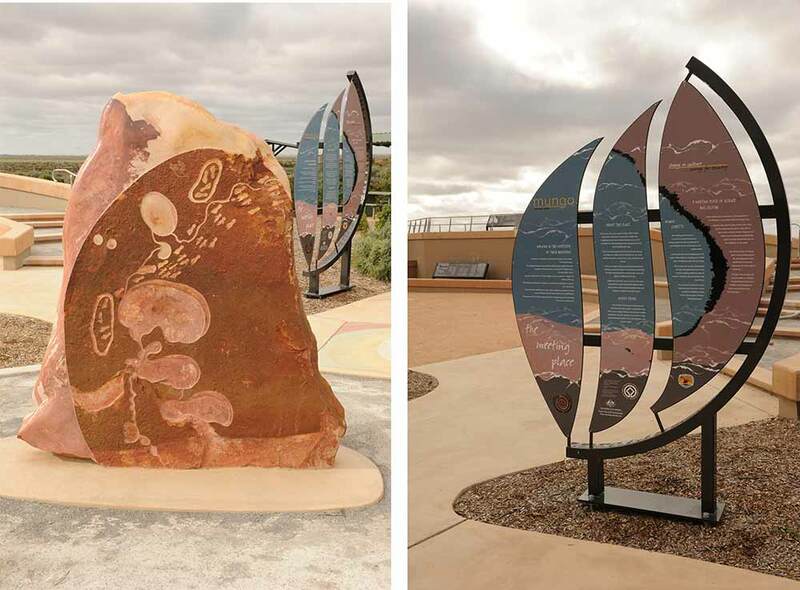 The overall context of the visitor setting within which people encounter interpretive material is a vital element to consider in any interpretive planning undertaking. Ideally interpretive planning comprises an integral part of the overall project development process such that it can inform and nuance the visitor settings being created. This ground up, integrated interpretive product experience is very difficult to achieve when interpretive product has to be retrofitted into a setting that may have been developed without interpretive planning input. 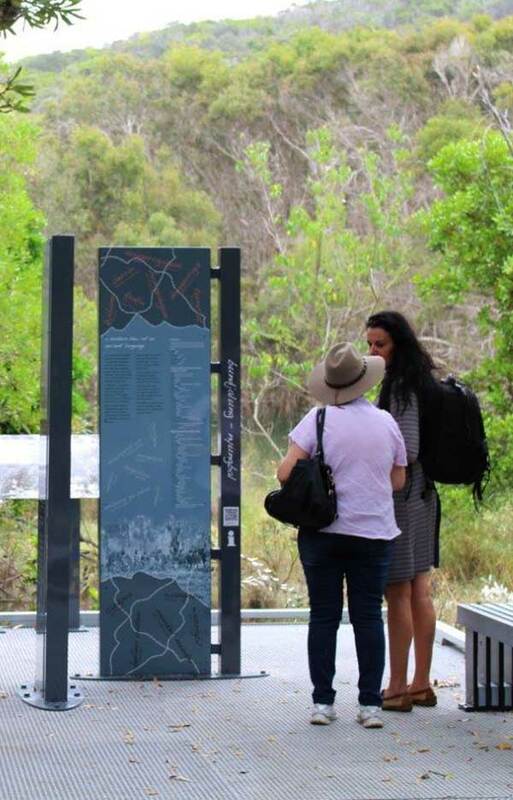 In the case of the Ballina Coastal Recreation Path interpretation through the East Ballina Aboriginal Place in New South Wales (left), interpretive design input led to the creation of a series of aligned visitor nodes where people could simply step aside from the cycle path to take in the content on offer in a safe and considered setting. This approach not only considered the safety of users as they stopped to connect with the product, but also provided a crucial context of considered repose within which engage with the visitor. Here people are invited to break from the "corridor" mentality that must inevitable attach to a journey along a pathway from A to B, to consider their surrounds from a different perspective. 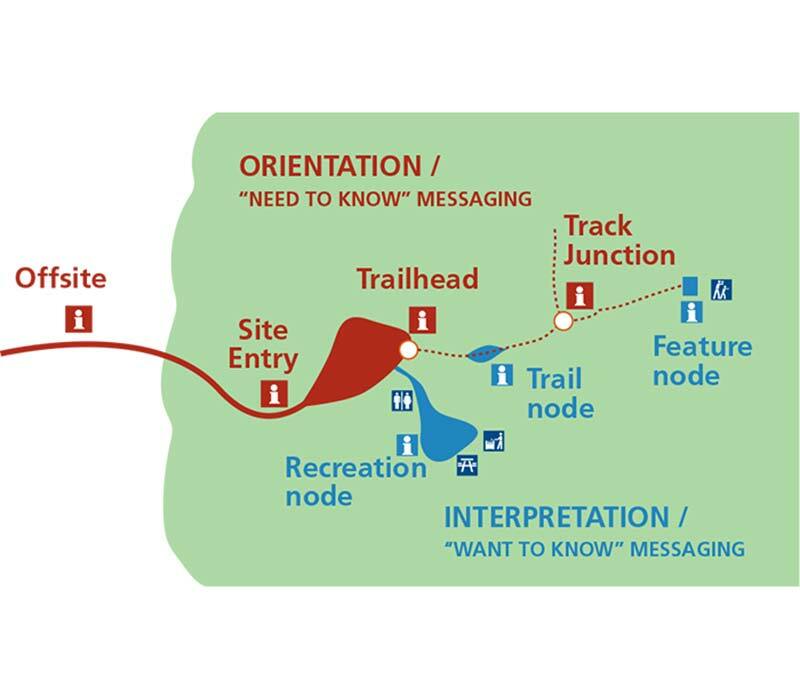 The careful use of nodes to deliver considered interpretive interventions underpins the interpretive planning process along a trail length. Sometimes these nodes comprise a significant step aside landscape feature as in the case of the Ballina pathway. They can also be as simple as inserting a landscape intervention into the pathway itself. 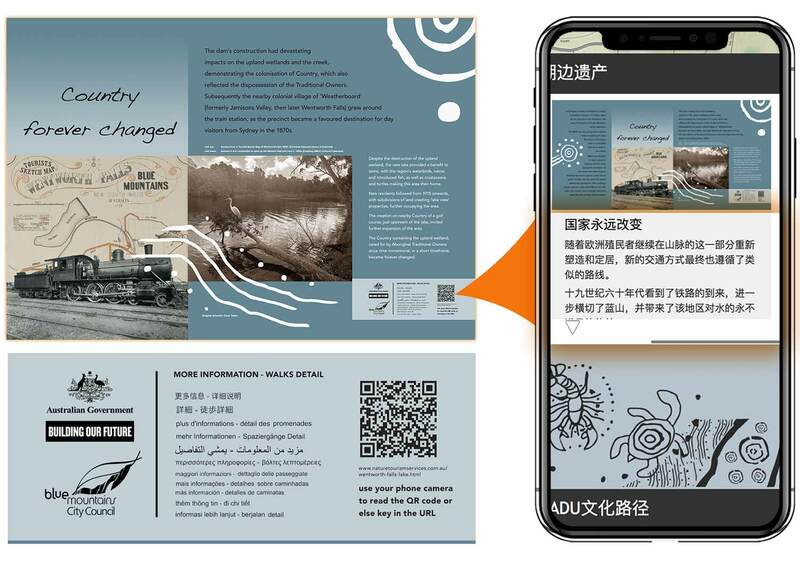 This ensures the visitor approaches signage content with a sense of arrival at the same time as providing impromptu seating that invites them to break their journey and take in the content on offer. 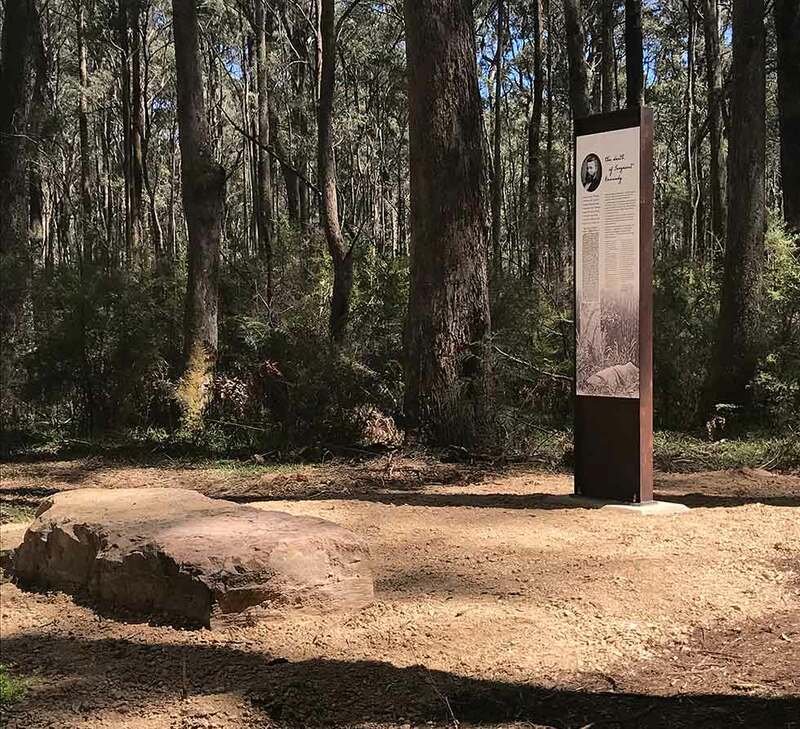 This approach is an integral part of the landscaped walking trail (above) around the Stringybark Creek Historic Reserve in Victoria. Another crucial element for interpretive planning to address is the overall role of visitor orientation material in the equation. Visitor orientation material helps people make choices about the visitor experiences on offer and to thereafter connect with these in a secure and confident manner. Interpretation materials play a derivative, subsequent role in this process, by assisting people to attribute positive meanings and values to their chosen experience. This simple approach understands that good interpretation is predicated upon good orientation materials being in place in the first instance. It is only once people are confident of where they are and what they are doing, that interpretive considerations can effectively come into play. 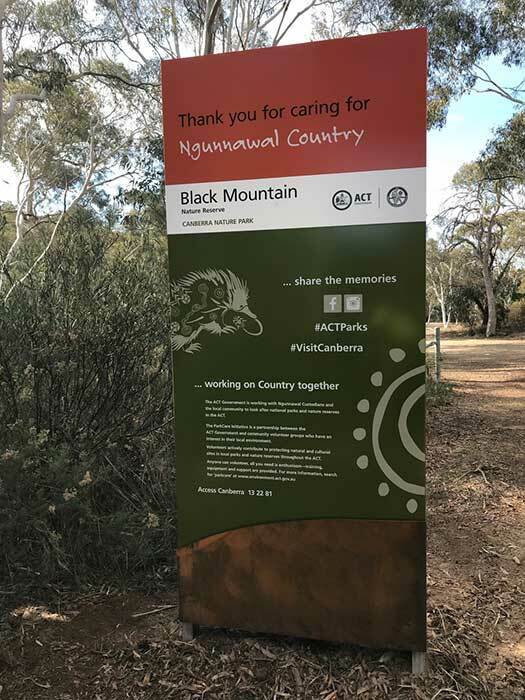 Recognition of this structural consideration was central to the work we undertook for the ACT Parks and Conservation Service in 2017 to assist them to develop a new suite of visitor orientation signage materials. 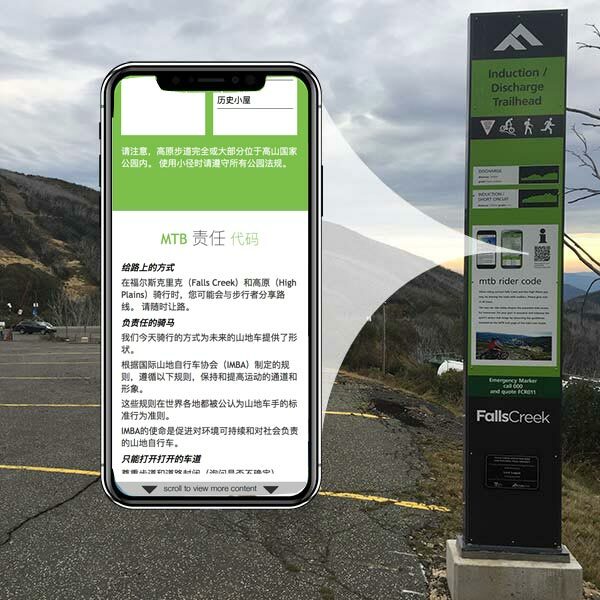 A central tenet of this strategy was the recognition that successfully conveying essential “need to know” visitor orientation information, required signage that is very simple and clear in its delivery. It stated that "Orientation signage must be reduced to an absolute minimum and be fit for purpose in terms of communicating its messages. Part of this means ensuring that it functions in peak load periods when carparks may be full and low level signage obscured." "This typically means making imposing statements on the landscape in a manner that may run counter to historical thinking whereby the visual impacts of signage in the park setting were sought to be minimised. Choosing colour schemes designed to blend in with the landscape however can result in signage being hard to discern." "Likewise small signage units that have little capacity to integrate additional or more complex messaging, invite the erection of additional small signage units as one management issue after another arises. 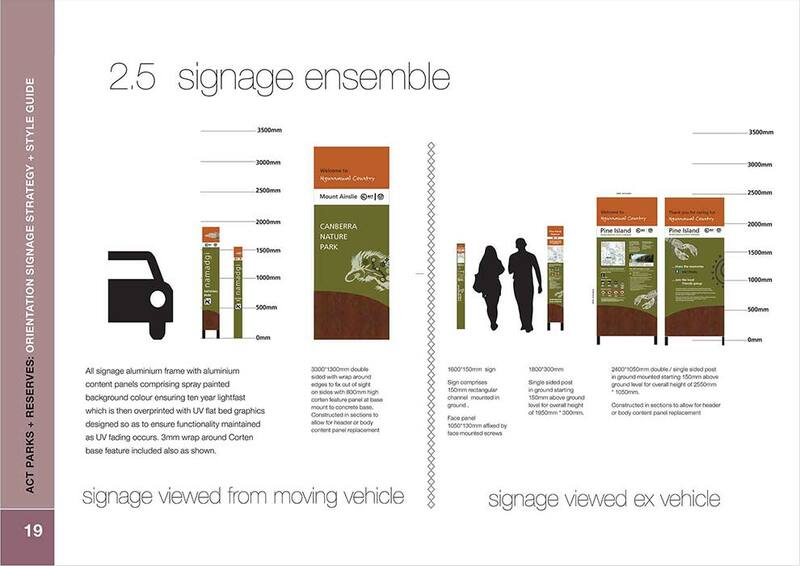 This results in a level of signage profusion that can impact on and detract from the entire aesthetic of a precinct. Removing this clutter and intervening in a minimal but purposeful manner is the underlying purpose of this strategy." The strategy also noted that "An essential part of the roll out process is recognising the natural domains that apply to the delivery of orientation “need to know” and interpretation “want to know” messaging. These must be clearly demarcated with each domain recognising the mutual benefit of respecting the other’s space." "As the diagram [left] makes clear, orientation intervenes at the points where people are crossing thresholds to connect with their environment and move from one precinct / activity to another. Interpretation messaging occurs when they are securely located within a given setting." "Where interpretive content is currently located in orientation settings, consideration should be given to moving it to a neaby, more appropriate setting [e.g. 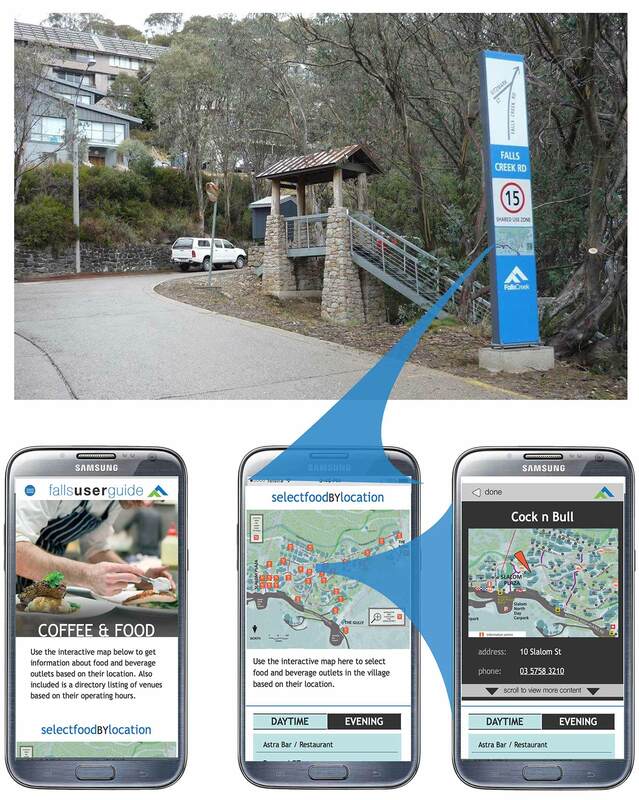 an interpretation sign being moved from a carpark trailhead to within a picnic area]." User expectations in regard to what information is on offer to them in their native language on a 24/7 basis have changed as result of the widespread uptake of smartphones and tablets since 2010. People now increasingly expect to make enquiries of the information media on offer to them. They also want to be able to easily and simply customise their own lines of enquiry. Managers also expect to be able to use new technologies to meet their core obligations including compliance with delivering essential content in line with user accessibility provisions. Increasingly this means publishing content across an array of formats including as PDFs and in HTML where it can be easily translated into other languages or delivered aurally by screen readers as desired. The new technologies available today in the form of both digital media and also in the production of materials like signage, requires nothing less than a fundamental reappraisal of many conventional approaches to interpretive planning if interpretive media are to remain relevant to a modern audience. It is no longer enough to simply roll out disparate stand alone interpretive products and expect the user to weave amongst these thereby creating the thread that somehow ties these together. This model was to a degree unavoidable in an age when managers had very little choice in relation to what long lasting, light fast materials they could deploy outdoors and visitor centres were recognised as a piece of crucial visitor infrastructure in many high profile settings. With little available choice in the materials mix on offer, investments in interpretive media tended to be capital intensive with mid-long term content replacement / update cycles. Today however we see a widespread shift across almost all aspects of public infrastructure to smaller more bespoke product solutions with lower capital costs and shorter content management cycles. In this modern realm it is the needs of the user, not the technological limitations of the manager that drives the delivery of communications product including interpretive media. This User Experience (UX) design model is only beginning to come into focus in terms of what it means for the interpretive planning process. The essence of creating an interpretive planning platform that is founded on UX design principles is to have one that favours small scale bespoke interventions that can address present needs while at the same time being capable of easily responding to future innovation. Similarly it recognises that the user should not have to reorient themselves to new content and differing mapping styles as they migrate from one form of media to another. Rather the information they receive from a sign should mirror the content they can access via their phone. While it is true that not all interpretive interventions will have a digital component, it is the case that all interpretive product solutions are now being delivered in a mobile optimsed world. Here the goalposts have been permanently shifted in relation to both user expectations and the level of effort people are willing to expend in order to access information.